CNN analyst calls trip "enormously high-stakes journey"
Peres: "The pope will be a most honored guest"
ROME, Italy (CNN) -- Pope Benedict XVI will leave for a weeklong tour of the Middle East Friday morning, the first papal visit to some of Christianity's most holy places since Pope John Paul II made the pilgrimage in 2000. 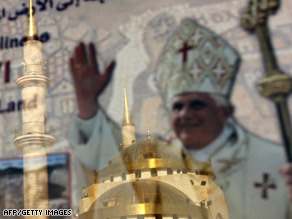 A mosque in Madaba, Jordan, is reflected in a shop window with a picture of Pope Benedict Thursday. The trip will take him to Jordan, Israel and the Palestinian territories. "On one level, this is a deeply spiritual experience for Pope Benedict XVI ... but this is also ... an enormously high-stakes journey that has obvious political subtext," said John Allen, CNN's senior Vatican analyst. "The pope will be facing not only the issues of Catholic-Jewish relations and Catholic-Muslim relations -- two faiths with which he's had his problems over the four years that he's been on the job -- but he'll also be wading right into the thick of the Israeli-Palestinian conflict." On Monday, the pope will fly to Tel Aviv to begin his visit to Israel and the Palestinian territories. He is scheduled to pay a courtesy visit to the grand mufti of Jerusalem and the two chief rabbis of Jerusalem. The leader of the world's estimated 1.1 billion Catholics is expected to visit Bethlehem, where Christian tradition holds that Jesus was born. The site is in the West Bank, which is part of the Palestinian territories. Israeli President Shimon Peres said he was "delighted" the pope was coming, when the dates for the tour were announced in March. "The pope will be a most honored guest, welcomed and respected by people from all walks of life. His visit will be a moving and important event bringing the spirit of peace and hope," Peres said in a statement. The pontiff will return to Rome next Friday.